In the grappling hook tesuji, a player uses the diagonal jump of to attach behind an opponent's stone. and not the thinkable 'jump-attach' or 'elephant(-jump)-attach' . 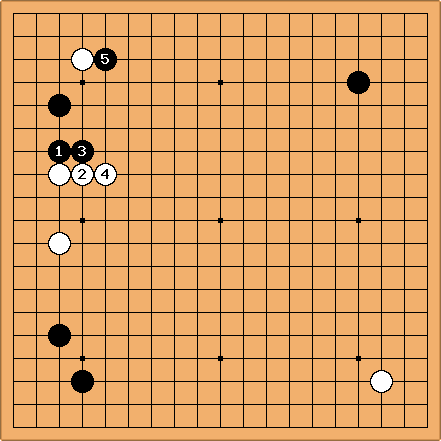 With , white threatens to connect under. 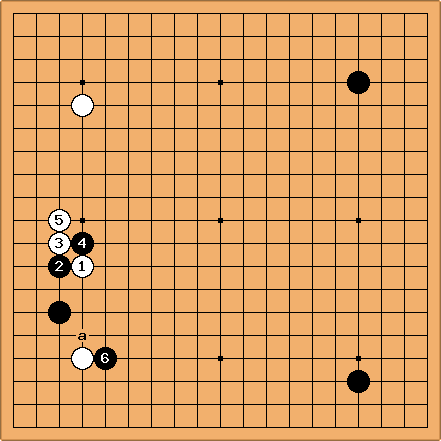 After black prevents this, white uses the grapping hook tesuji with with the purpose of making life in the corner. 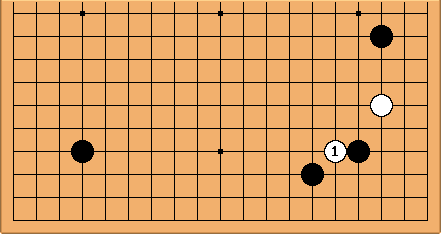 black prevents white from connecting, after which white plays the hane of , which is also a grappling hook from the point of view of . 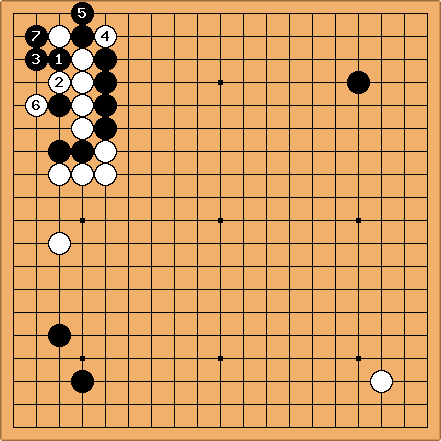 With , white finally secures life in the corner. 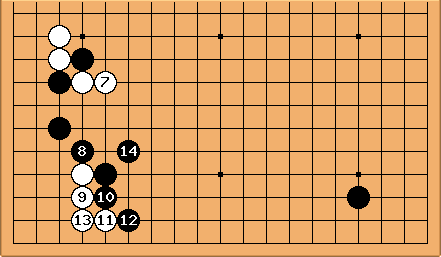 looks like a new move in this joseki. Herman: If White plays in response to , black sets up a driving tesuji with . 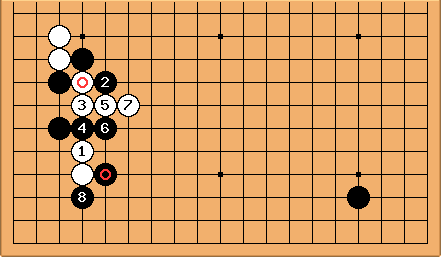 White will now either have to sacrifice , giving black a ponnuki in the center, or suffer severe damage to his corner through the sequence shown. 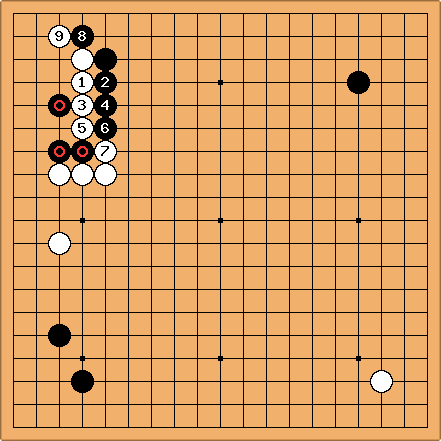 In the game, White played , preventing the possibility of a driving tesuji. 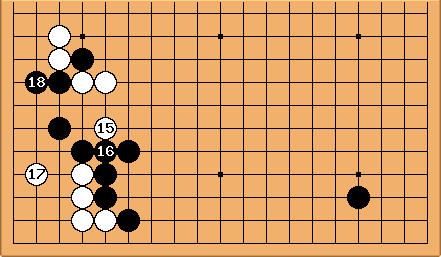 With this option gone, black defended the weakness of his diagonal jump, and play continued as shown. - show Kajiwara's creativity. After White looks a bit overconcentrated on the left side. So Black can freely sacrifice the marked stones. shows Kitani's creativity. forces White low on the top side. The name "grappling hook tesuji" was coined on Sensei's Library by Herman Hiddema, and is not found in literature.